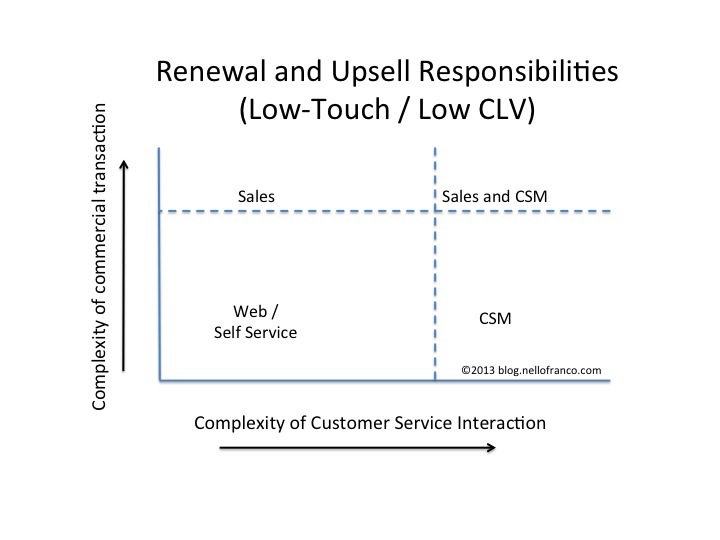 Renewals, Up-Sells, and Cross-Sells: CSMs, Sales, or Online? One of the most common organizational questions/challenges facing SaaS companies is figuring out which group has responsibility for up-sells and cross-sells. Is it CSMs or Sales? If Sales, is it the same sales team that does the hunting for new customers? If it’s some combination, where do the lines get drawn? Before getting into the framework for making this decision, though, I think it’s important to clarify the primary purpose of a CSM organization in a SaaS company: Ensuring customers are getting value from the SaaS offering. The framework I’m proposing makes the fundamental assumption that the primary objective of a CSM function should be to help a customer base achieve measurable value and results from a company’s product or service. Without that value-based foundation, any renewal, up-sell, or cross-sell attempt is an uphill battle. The objective of the CSM function should be first and foremost about creating and maintaining a value-based relationship across a set of customers, whether high-touch or low-touch. That foundation then breeds loyal customers, advocates, and additional revenue. 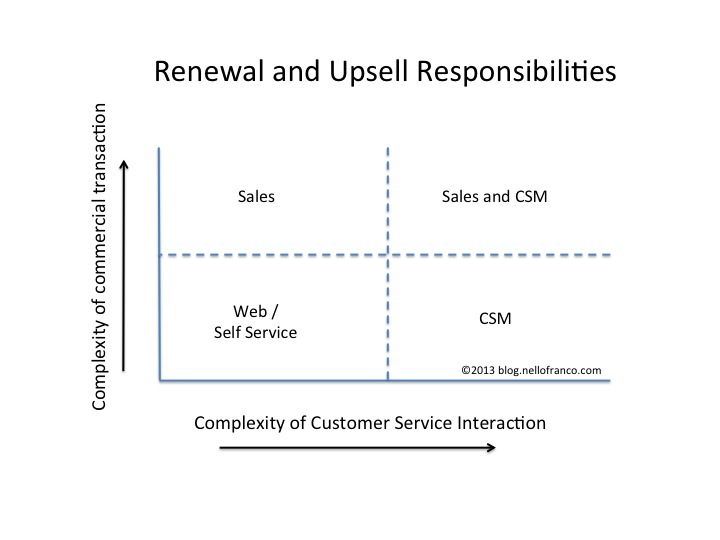 So… if the CSM role is fundamentally about the value relationship, how involved in the up-sell, cross-sell, and renewal transactions should they be? CSM involvement (and value) in the sales process will be greatly influenced by the amount of assistance/interaction your solution requires in order for your customer base to really get value. Is it completely self-service, self-installing, requiring zero human interaction or does it require significant assistance, mentoring, education and coaching by someone on your CSM team? While there is no absolute way of measuring degrees of complexity, you may want to ask yourself a few questions like: “Can my customers (or some segment of my customers) achieve value without the interaction of a CSM?”; or “Is my company’s product meant to be completely self-service without the need for any human interaction, or is there a heavy Services and consultative component required for my customer base to obtain real value from my product?” This line of questioning will give you an idea of how much value a CSM would provide in the upsell, cross-sell, or renewal opportunities. 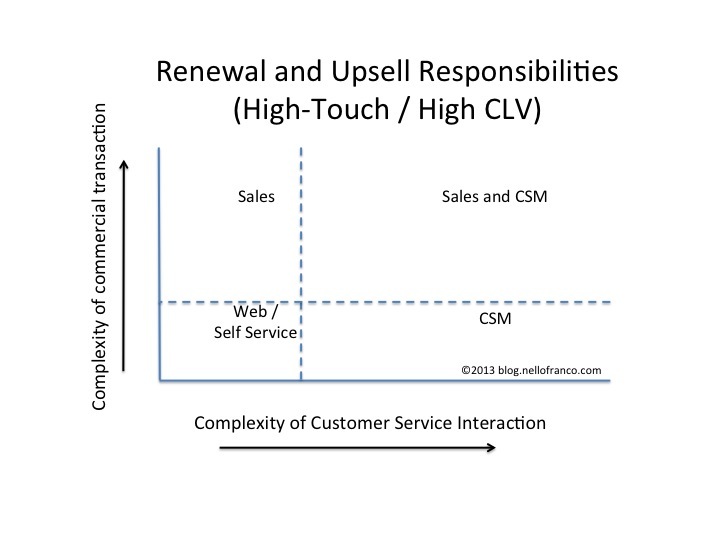 If a high-touch CSM relationship is necessary to help customers get value from your product, a similar interaction model is likely necessary in order to position the value of additional services or offerings. Some solutions have a low-friction commercial aspect to them. Think online transactions. Low-volume, online purchases from a published price list clearly fall into that category. A small business user signing up for MailChimp, or an individual or workgroup signing up for DocuSign can be completely accomplished via web-based transactions with little (or no) human interaction required. Enterprise, high-volume, or non-standard pricing scenarios, however, will require interaction and likely negotiation with a sales rep. While each of these dimensions is straightforward in and of itself, looking at your offerings across both dimensions can give you better insight into how to structure your organizations. Also note that this framework isn’t intended to apply to your entire company and/or product line. It can be applied to individual customer segments, markets, product lines or service categories. The scenarios also tend to get more interesting when you look at high complexity service offerings which also have high complexity transactions. An example of this would be a high volume / enterprise agreement with a customer for a highly consultative solution offering or managed services provided in addition to the SaaS platform. Any modification to this kind of agreement will require custom pricing, negotiation, and a consultative sale involving an expert in the deal. In this scenario, Sales and CSMs might team together in a manner similar to Sales and SEs would for new business opportunities. This scenario is represented in the upper right hand corner of the charts. There is an obvious third dimension here, and that’s the ACV (or CLV) of a customer. In those cases, the quadrants would shift closer to the axes for high ACV/CLV customers as they would warrant a higher touch, while the quadrants would shift away from the axes for low ACV/CLV customers as they would warrant a lower touch (see figures 2 and 3 below, respectively). So… while there is no single answer for assigning responsibility across the organization. This framework provides a way to help distribute responsibilities based on some key factors. Which factors have you used in determining how to structure your organization’s up-sell and cross-sell responsibilities… and how have you addressed compensation and incentives in each model? Sign up via email for content updates. Enter your email address to follow this blog. Receive notifications of new content by email. B2B Customer Segments: Where Do You Draw the Line? © Nello Franco and blog.nellofranco.com, 2012-2015. Unauthorized use and/or duplication of this material without express and written permission from this blog’s author and/or owner is strictly prohibited. Excerpts and links may be used, provided that full and clear credit is given to Nello Franco and blog.nellofranco.com with appropriate and specific direction to the original content.